Dr. Meng is a graduate of the National University of Singapore and has over ten years of research experiences in internet industry, fin-tech industry, telecommunication industry, and information systems. Dr. Meng leads the project “Digital China Index”, which use billions of users’ real time data to measure the adoption of mobile internet in 31 provinces and 351 cities in China. She also lead “Internet+” project, which help many provinces and cities in China implement “Internet+” strategy. In recent years, she has numerous research reports published in China Daily, the Harvard Business Review, and other notable publications. She has been featured in an exclusive CCTV interview (a top TV channel in China). Her book, Management Economics, has been used as teaching material by many of the top MBA programs. Prior to JD Finance Research Institute, Dr. Meng was the Chief Economist and vice dean of Tencent Research Institute, Deputy Secretary of Tencent Foundation. 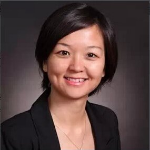 She also worked as the director of Deloitte TMT Center of Excellence, research leader of Accenture Institute of High Performance, chief researcher of Samsung Economics Research Institute, and assistant professor at the Renmin University of China.